The biggest obstacle facing any prequel is that of keeping an audience engaged even when they know the broad strokes of how the story will finish. It's not a problem unique to prequels - most people were probably aware that Lincoln wasn't going to end with an Animal House-style freeze frame explaining how awesome Abe's second term and subsequent retirement were - but it's still hard to make what is essentially back story compelling when the blueprint has already been laid out so thoroughly before. At their worst, this can result in films that consist of little more than colouring in parts of a picture which is already pretty complete, and in the process runs the risk of marring it with talk of midichlorians or amnesia bullets. But even bad prequels tend to be driven by a question that the audience might have asked themselves, even when they have a rough approximation of the answer. The original Star Wars trilogy gave a sense of how Anakin Skywalker became Darth Vader, but not that many specifics about the actual process of how that happened. It's not surprising that people turned out to see that story acted out over three subsequent films, no matter how haphazardly it was executed. However, while a lot of moviegoers were probably curious about how Darth Vader came to be, I'm not sure that many walked away from 2001's Monsters, Inc. thinking, "I wonder what Mike and Sulley's college days were like." In that respect, it could be argued, and argued fairly convincingly, that Monsters University is a wholly unnecessary film. It's an answer to a question that no one was asking. It fills in information that probably only Pixar fanfic writers (I assume that they exist, despite having done no research, because this is the Internet and everything exists) were clamouring for. Basically there is no real need for Monsters University to exist beyond reasons of pure economics and brand recognition; of having recognisable characters that can be easily slotted into a new story. Yet contrary to what this might suggest, the film's superfluous nature might be its greatest strength. It has no grand mythology to explain and risk demystifying, no long-pondered mysteries to resolve to the possible disappointment of fans, no chance of spoiling the first film's utterly perfect ending. In short, it has nothing really riding on it besides making an entertaining film, something at which it succeeds with little effort, even though it rarely hits the heights of the original. 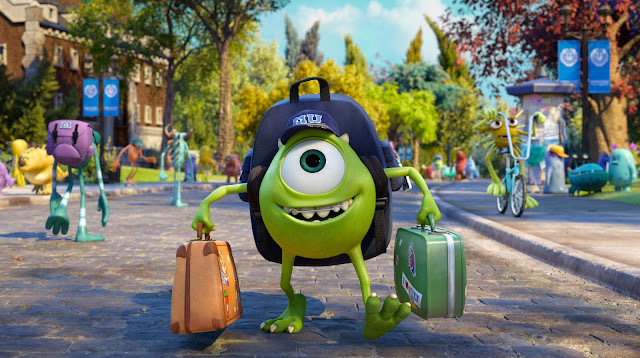 After a brief prologue in which an adorably wide-eyed Mike Wazowski (Noah Johnston as a child; Billy Crystal as an adult) gets to visit Monsters, Inc. on a trip with his class and gets inspired to become a world class Scarer, the film unfolds over the course of his first year as a student of M.U. 's prestigious Scare program. Mike has managed to land a spot on the program through sheer hard work and graft, studying constantly and mastering the theory of Scaring, even though he looks like an ambulatory beachball and as such is about as scary as the alien from Dark Star. This immediately sets him at odds with James P. Sullivan (John Goodman), a preternaturally gifted Scarer who places so little stake in studying that he doesn't even bring a pencil to their first class. The two future best friends are therefore immediately placed on either side of the classic jocks vs. nerds divide that forms the basis of so many college movies. Sulley, thanks to his size, ferocious appearance and a family lineage loaded with great Scarers is anathema to Mike, who has worked tirelessly to get accepted onto the program and believes that he can overcome his frankly less than intimidating appearance to become the greatest Scarer who ever lived. The film gets a lot of mileage out of their rivalry, largely because it is shaped by our understanding of the irony that these two bitter foes will one day be inseparable friends and colleagues. While that makes the first half an hour a lot of fun, the main thrust of the story doesn't really kick in until Mike and Sulley inadvertently wind up on the wrong side of Dean Hardscrabble (Helen Mirren), the haughty, terrifying head of the Scare program who kicks them out after a fight goes awry. This sets in motion a chain of events that leads to a big contest between the different Monster fraternities that Mike and Sulley have to win at all costs. At an hour and forty-four minutes, the film is a touch too long, and much of the bloat comes from the middle section which is focused so intently on these Scare Games. While the Games themselves are interesting and nicely designed, particularly one in which the characters have to dodge spiky balls which cause them some inflammatory issues, and the other members of the team (voiced by Charlie Day, Sean Hayes, Dave Foley, Joel Murray and Peter Sohn) are well-drawn and bounce off each other nicely, everything around the Games slows things down to a crawl. A crawl that is admittedly peppered with good gags and nice moments, but a crawl nonetheless. As with so many things in life, though, things pick up once we get to a montage. After the expected moment of doubt and despair that comes in the second act of almost every competitive film, Monsters University dispenses pretty quickly with the rest of the Scare Games, which ultimately serve mainly as a device to bring Mike and Sulley closer before fracturing their newfound friendship in the last act, which is where the story really comes together. There's nothing as exhilarating or daring as the chase through a thousand doors that served as the climax to Monsters, Inc., or anything as heartbreaking as Sulley walking through that once broken door, but director Dan Scanlon and his team still offer a couple of moments of earnest, heartfelt emotion and excitement that bring the characters to a point where you can easily see how they would become the characters in the first film. Monsters University lacks the charm and wit of the original, but it's by no means an embarrassment to either its predecessor or the illustrious reputation of its studio. It sticks a little too rigidly to the structure and beats of the campus comedy, but it earns its moments with heartfelt sincerity and plenty of solid jokes, and has a lot of fun expanding upon the world of the original without getting too bogged down in nodding towards its predecessor. (When it does, such as in a subplot explaining why Randall (Steve Buscemi) hates Mike and Sulley, it's awkward, unwarranted, but mercifully brief.) It is put together with the customary visual sumptuousness that we have come to expect from Pixar, and it's an immensely solid and fun film that never rises to being exceptional. It's a wholly unnecessary film that I enjoyed a great deal.